This weekend, I figured out that I pretty much have to finish a line item a week to get this darn “Thirty before 30” list completed. I am not going down without a fight! I do think I can finish it, but it’s going to take some efficient use of time. Thankfully, I tackled #8 today, and I am encouraged that I can do the list. I don’t know about your families, but in ours, we acknowledge birthdays. I love birthdays, and it really means a lot when someone remembers your big day. Even in college, I would run to the Vanderbilt bookstore and pick out cards for relatives’ birthdays … it was the highlight of my day. 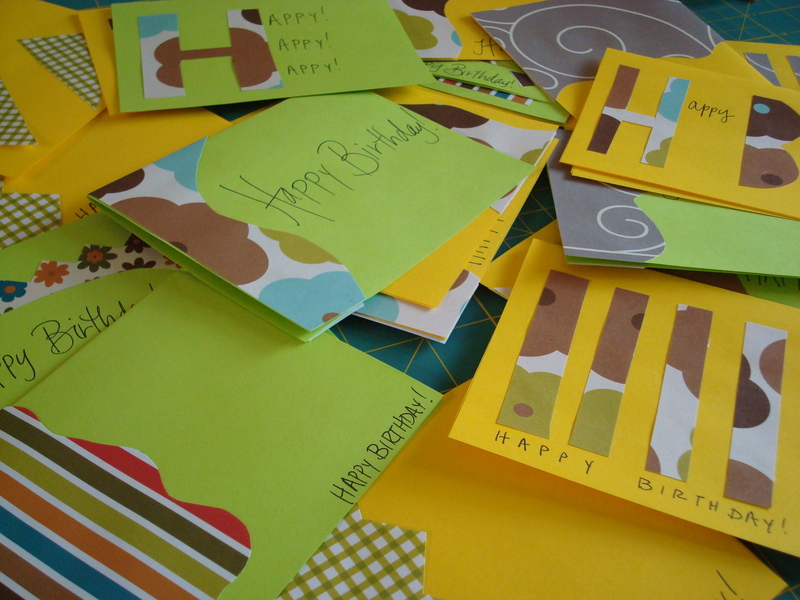 I still love doing it now, but to be a little more personal, I make the cards myself. 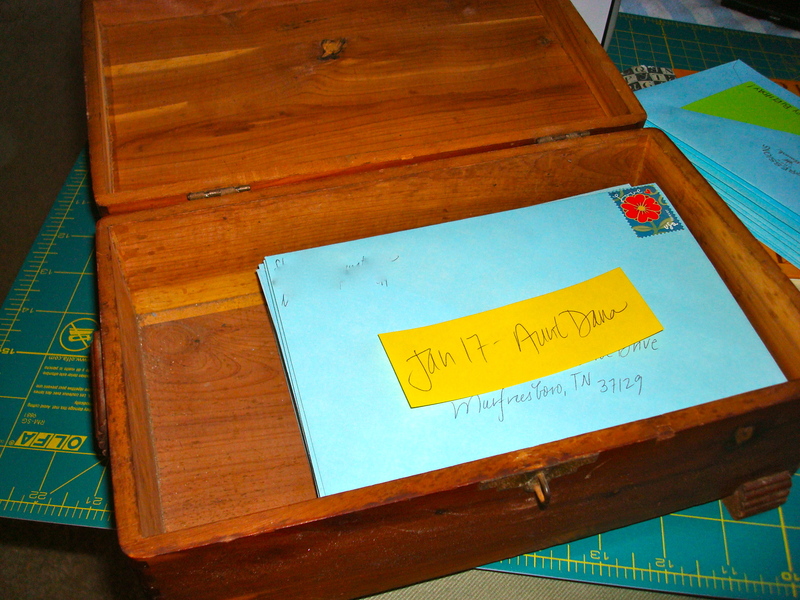 This has always felt more meaningful to me (plus it’s more fun), and I hope the receiver appreciates the extra effort. This can be taxing though when I have to make almost two personal cards per month for the 23 members of our families that I send personal cards to. Just this past week, I almost forgot my sister-in-law’s birthday because I kept remembering at inopportune times: on my commute, in a work seminar, and when I was about to fall asleep (Mary Peyton, I thought of you a lot last week!). All that to say, I am thrilled to have knocked off #8, not only because it will be hecka convenient, but I also won’t miss another big day! 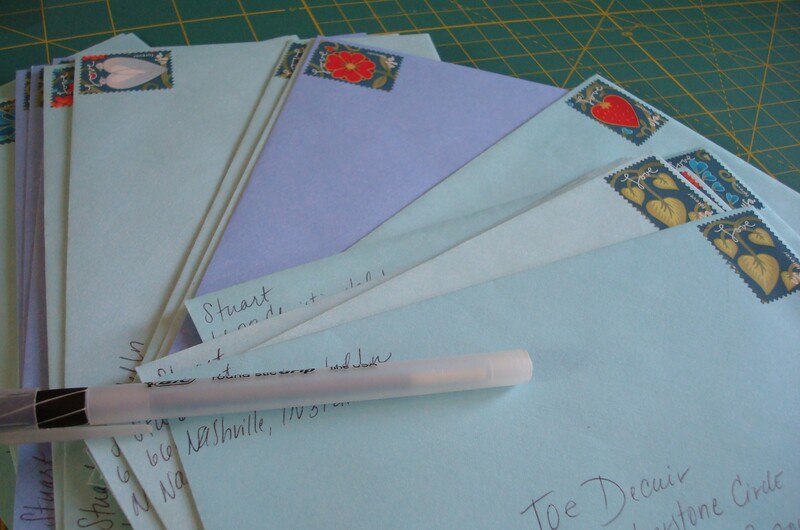 So, I purchased a bunch of stamps, collected all my supplies, addressed envelopes, and got down to business creating a bunch of birthday cards. I realize that it may seem a smidge impersonal to get all of this done ahead of time, but don’t worry: I didn’t write the inside messages to folks. That would be kind of lame. Also, I’m all set with birthday cards through November, 2012 (I got a bit overeager with my card-making), so I’m through the first 8 months of our future baby’s life! I put all of them in a wooden box with a lid (to prevent dust build-up), and I’ll drop them in the mail when the date is right! P.S. : I will show you the nursery soon, but there is a giant dresser in the middle of the room and we need to move it. Until then, hold your horses! It’ll be so much better without the big piece of furniture smack dab in the middle of the room. ← Friday Feast: More Chocolate Chip Cookies!